Theres something about brown butter that just screams fall. It’s right up there with any and every food made with pumpkin come fall time. Don’t you worry I will have my fair share of pumpkin recipes to share in the coming month, but I figured we would give the poor pumpkin a break 🙂 With that being said I had three poor spotted bananas laying on my counter, which means one of two things a smoothie or banana bread. I’ll let you guess the winner 😉 Brown Butter Banana Bread with Dark Chocolate was the creation of the night. The brown butter brings out a wonderful nuttiness, that combined with brown sugar and the bananas tastes like heaven. 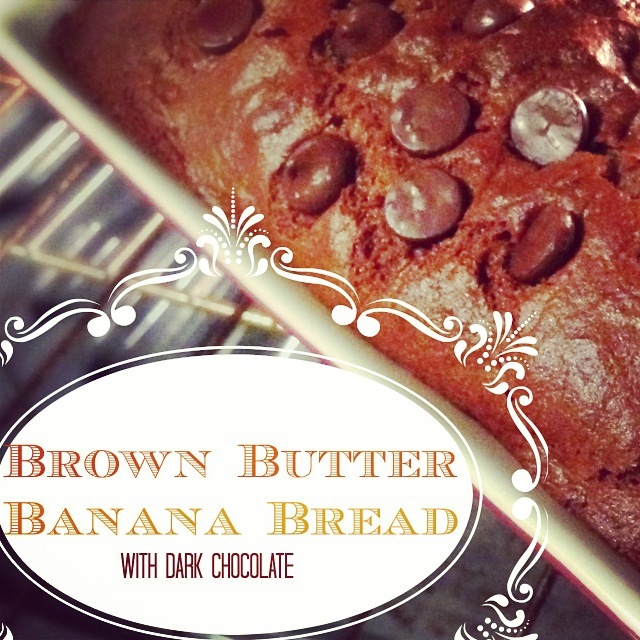 I hope you enjoy this banana bread recipe as much as I do. Whats your favorite go to bread recipe? Pre-heat the oven to 325*. Grease a loaf pan and set aside. In a small sauce pan melt the butter and cook until all of the brown bits start to form. Make sure you watch the butter carefully because it will go from almost brown to burnt in seconds. Trust me its worth the extra effort to make the brown butter. Allow the brown butter to cool slightly to avoid cooking the eggs in the batter. In a large bowl combine the cooled brown butter, bananas, brown sugar, vanilla and eggs. Once they are all combined add all of the dry ingredients. String until completely combined. Pour the batter into the loaf pan and top with the dark chocolate chips. Bake for about 40 min or until you can insert a toothpick into it and it comes out clean. Allow the bread to cool if you have enough will power or eat it fresh from the oven with a bit of butter. In a large bowl combine the cooled brown butter, bananas, brown sugar, vanilla and eggs. Once they are all combined add all of the dry ingredients. String until completely combined. Pour the batter into the loaf pan and top with the dark chocolate chips. Bake for about 40 min or until you can insert a toothpick into it and it comes out clean. Allow the bread to cool if you have enough will power or eat it fresh from the oven with a bit of butter. 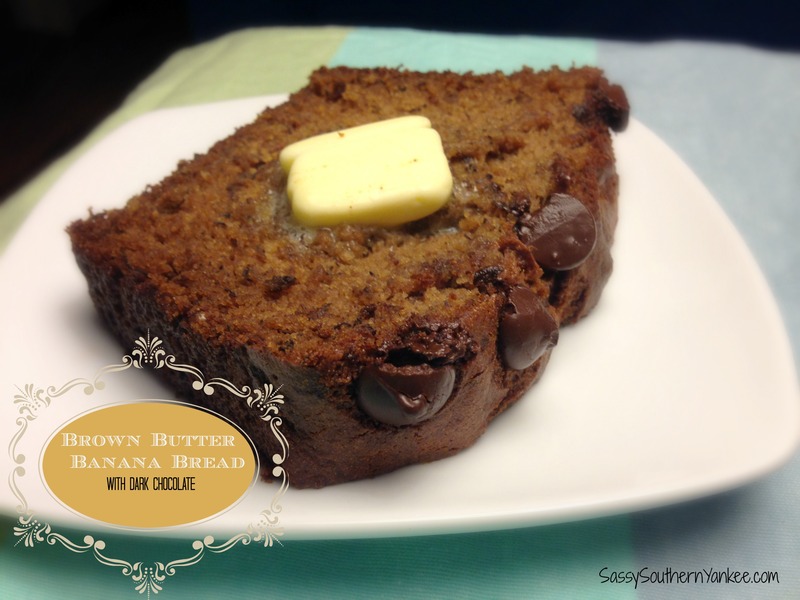 This entry was posted in Breakfast and tagged Banana, Breads that freeze, Brown Butter, Brown Butter Banana Bread with Dark Chocolate, Brown Sugar, Dark Chocolate, Gluten Free, leftover bananas, Quick Breads.